Our Parent/Child programs create lasting memories, foster achievement and develop skills that both parents and adults will cherish for a lifetime. You will stay in our year-round cabins unless otherwise noted, and enjoy meals in the dining hall. Please feel free to contact us if you have any questions! Adventure is out there, and we'll take you to find it! Our trained staff will guide you on a 19-mile paddle down the Delaware River. We'll camp at a riverside campsite, and cook and swim together. Canoes, paddles, tents, dry bags and PFDs are provided - let us know if you need any additional equipment. Adventure is out there, and we'll take you to find it! Our trained staff will guide you on a 19-mile paddle down the Delaware River. We'll camp at a river-side campsite, and cook and swim together. Canoes, paddles, tents, dry bags and PFDs are provided - let us know if you need any additional equipment. Spend the weekend in a seasonal cabin (or maybe a tent) while you enjoy classic camp activities with your child. Archery, campfires, boating and climbing will be open for you to try. Spend the weeknd building confidence and having a lot of fun. Finding your way while orienteering, hiking to a majestic overlook and working together to create fire through friction will enhance your relationship with your son. Create works of art, relax by a fire and make the weekend memorable. You and your child will get a hands-on experience creating a beautiful wood project for your home in this fun weekend. Outside of our woodshop, you’ll be inspired by all of the fun activities we have at camp. Working together, you’ll build more than just a bird house, you’ll build a memory that will last a lifetime. Build a survival shelter, create a fire through friction, cross country ski and enjoy roaring campfire with your son. Our archery range, rifle range and indoor climbing wall give dads and sons the opportunity to try new things and develop skills together. Hikes, arts & crafts and target games are just some of the activities that you and your daughter will enjoy together at camp. This weekend is sure to bring moms and daughters together for a weekend of fun and adventure! Go on a hike, climb the wall or even get your nails done - what's most important is having fun together. Dads and daughters are invited to spend a meaningful weekend together trying something new, challenging themselves and building a strong and trusting relationship. Our seasonal cabins (or for the more adventurous, a tent) will be your home for the weekend. Classic camp activities like archery and campfires, plus boating and swimming in beautiful Fairview Lake will be available to strengthen the bond between father and child. 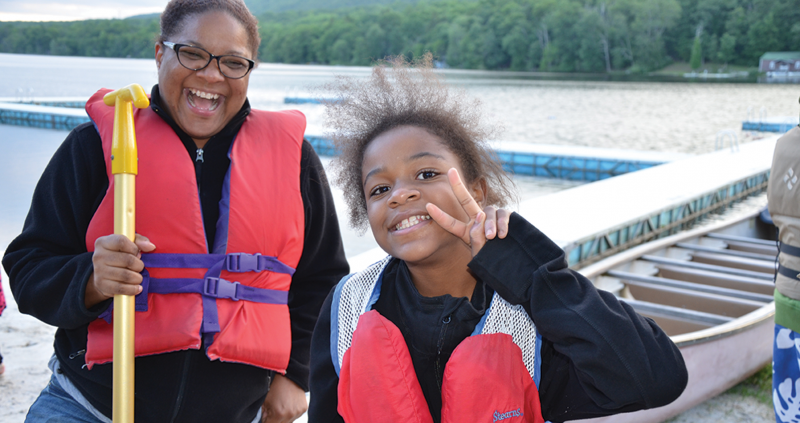 By registering for a Fairview Lake YMCA Camps program, the individual agrees to indemnify and hold Fairview Lake YMCA Camps (henceforth “the Y”) harmless for any loss of property of injury to any group member, guest or invitee using the facilities and/or services of the Y. The individual recognizes further that the Y is a charitable association within the statutory definition and the Y is immune from liability for damages under NJSA 2A:52A-7 et seq. The individual agrees to provide adequate and competent supervision of any minor members, guests or invitees while using the facilities and/or services of the Y.